Coral is one of the UK's leading sport betting bookmakers both online and on the high street. This Coral sign up offer is for registered members numerous sports betting options along with an online casino. Right now, they are giving out a Coral sign-up offer of bet £5, get £20. Register at Coral.co.uk and make sure you to get the Coral promo code. UPDATE: There is no Coral promotional code available right now to get this Bonus. But make sure you click on our special Link above and follow the instructions. You may not use Moneybookers, Paysafe, Neteller or Skrill to deposit funds. To qualify for this bet £/€5 get £/€20 in free bets Coral sign-up offer, the first bet on your account after registration must be a real money sports bet of £/€5 Win or £/€5 Each-way or more at fractional odds of 1/2 (decimal odds 1.5) or greater. The 4 x £/€5 free bets will be triggered by the placement of the qualifying bet and will not apply to subsequent bets. Void bets do not count towards this promotion. The qualifying bet must be made within 14 days of account registration to qualify. First sports bets placed after this duration will not qualify for this bet £/€5 get £/€20 in free bets offer. You can only use your free bet token within 4 days. The free bet must be wagered in full, can be redeemed on win or each-way bets and can be used on the following listed bet types: single, double, treble, 4-fold and upwards accumulator, forecast, combination. You can't use this promo in connection with other Coral offers. Furthermore find a Deposit £5, get £20 tournament tickets promotion in the poker section. This only counts if you are a new customer to Coral and make an initial payment of at least £5. 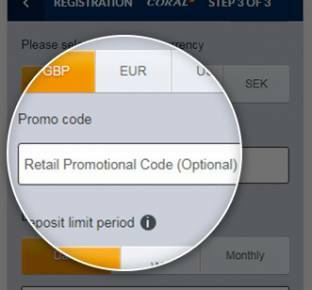 No Coral poker promo code is needed for this offer, simply click on the exclusive link above. By downloading the Coral Mobile Application from the App Store or the Android market you will not have only the possibility to bet while you are on the go. Furthermore you have access to the UK horse races via Live streaming. But the great news is that you get a Coral sign-up bonus for 2015, if you register quickly. Just like the Coral sign up offer, with #YourCall, you call the shots. Do you think you have the winning match and player stats bet? You can combine match betting with stats like assists, passes, shots, shots on target and tackles in any way you want. Tweet your bet @Coral with #YourCall, and get your price. Or select from the bank of #YourCall specials that are already there for you to bet on. #YourCall is available every week on all Premier League, Champions League, La Liga and Serie A matches. Give #YourCall a try for any of these matches: Premier League, Champions League, La Liga, Serie A. Apart from football, they also cover a wide range of popular sports from tennis, horse racing and even badminton. They even cover all the American sports from baseball, NHL and basketball. With so many regular and in-play markets to choose from, and Coral covering nearly every live event across the globe, you will always have something to look forward to when it comes to sports betting with Coral. With so many unique and interesting features such as cash out, enhanced odds and livestreaming, you're guaranteed one of the most worthwhile sports betting experience in the market today. No codes for members allready then? ?